Mike Yeo? More like Mike No, amirite?! As I’m sure you’ve heard by now, Mike Yeo has been relieved of his duties as head coach of the St. Louis Blues. The news here being that this inconsistent hockey team actually had a head coach for the first part of the season. He’s right! They DO need to move forward and get better! However, Berube is only an interim and probably will not be the answer this team needs in the long run. I mean, how often do interim coaches work out?? But still, there are really good options out there for the Blues to fill this head coaching vacancy. And by options, I mean option. Singular. As in there is only one man who should be considered for this job. I’ll give you a hint as to who. His first name is Joel. I’ll give you another hint. His last name is Quenneville. If that name sounds familiar, it’s because Joel Quenneville used to sit behind the bench of the St. Louis Blues. In his time as Blues head coach, Quenneville failed to make the playoffs only once – in his final season – and that was only because he was fired 61 games into the season, meaning he made the playoffs every year as a head coach of the Blues, and in 2001, he was 3 wins away from winning the Western Conference and advancing to the Stanley Cup Final. In fact, the year after he was fired by the Blues, the NHL season was cancelled due to a lockout. A lockout which I assume was started because the league owners were so shocked that the Blues fired Joel Quenneville. They basically felt the season could not go on after that. Don’t look that up. Just trust me. While I’m firing off fun facts about Q Boy (also, I just started calling Joel Quenneville ‘Q Boy’), check out this one. He also used to play for the Colorado Rockies. Crazy, right? Well, not the Dante Bichette Colorado Rockies… just the hockey team now known as the New Jersey Devils. Although, I’d be willing to bet Q Boy could hit a curveball. He’s that good! 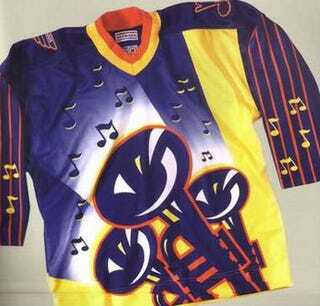 Now, if you’re still on the fence about whether or not the Blues should bring back Q Boy, that’s totally normal. I went ahead and came up with a list of six reasons why the Blues should bring him back. This is the first Stanley Cup Joel Quenneville won. He was the head coach of the Chicago Blackhawks when he won it. I know, I know. It physically hurts me to type that as bad as it does for you to read that. However, it’s true, and it’s a fact we must face. This is the second Stanley Cup Joel Quenneville won. It may look a lot like the first, but trust me, it’s sweeter. Winning a Cup is nice. But winning multiple Cups? That’s real nice. This is the third Stanley Cup Joel Quenneville won. Alright, this is just getting absurd now. This man won THREE Cups with a franchise that hadn’t won one since 1960. Prior to Quenneville’s arrival in Chicago, Blackhawks sweaters were best known as props from Wayne’s World. That glorious mustache. I mean, just look at that thing. Sure, I know having a mustache in this town doesn’t automatically make you a good coach (cough Jeff Fisher cough), but that sensational lip sweater paired with a Cup (or three) on your resume makes you a darn good coach. That ‘stache is the best thing to hit the NHL since these bad boys. This one is actually more logistical than anything, but if you’ve ever worked in HR, you understand. Re-hiring someone who’s worked with the company before is just easier. You probably still have that person’s paperwork and information on file, you don’t have to show them around, and you can probably just reuse a bunch of the same graphics and imaging from his first stint here in town. Plus, this would provide a chance to sincerely apologize face-to-face for ever letting him go in the first place. Seriously, Q Boy. We’re sorry. We get it, Q Boy. It’s not easy having to work for a team liked by Vince Vaughn. If you saw season 2 of True Detective, then you understand what I mean. And technically, the Blackhawks haven’t won a Cup since that season aired. So do the right thing, Blues. Bring him back. And by him, I mean Joel Quenneville. And by Joel Quenneville, I mean Q Boy. Because frankly, this city could really use a Cup. Or three.